In order to manage a successful employee advocacy program, it’s important to be on the same page as your employees. Knowing how your employees prefer to promote your brand on social media is a huge advantage. You know what to ask of them and what not to. This reduces friction and makes you more efficient with every activity. To help you get a better understanding of your employees’ habits, we’ve aggregated the most frequently requested activities by our customers running employee advocacy programs (Gaggle Managers) in 2018 and compared it to the most frequently carried out activities by the individual Members of their programs. Here, we dig into whether or not employee advocates complete the actions requested of them. We found that LinkedIn activity requests garner the most responses from employees compared to how often they're requested by managers. You can see in the chart above that sharing a post on LinkedIn is the tenth most acted upon activity by employee advocates. This might not sound very high, but considering it’s only the 15th most requested activity by managers, that’s a big jump. Additionally, commenting on a post on LinkedIn is the second most acted upon activity by Gaggle Members, while being the third most requested. And liking a post on LinkedIn is the third most acted upon activity and the fifth most requested. Your users are more than willing to promote your organization on LinkedIn, and this is no surprise. LinkedIn focuses on professionals, so for employees to promote their organization, talk about their industry, engage with other professionals and promote their personal brand is what LinkedIn was made for. When comparing the requests of Gaggle Managers to that of their employees, it’s easy to see that managers request activities on Facebook more often than members perform them. Five of the top ten activities managers request are on Facebook including the first and fourth most frequently asked for. 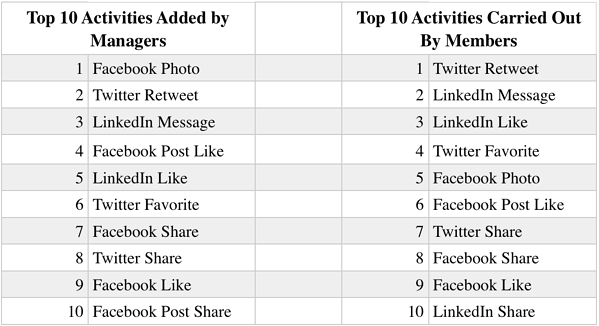 Having said that, only four Facebook activities are in the top ten most frequently carried out actions by members, and none of them are in the top four. Conversely to LinkedIn, people use Facebook for personal and social intentions. The large majority of people on Facebook aren’t there to promote themselves professionally, so it’s not a surprise there is some resistance there. Does this mean Facebook doesn’t work for employee advocacy? Absolutely not! There are countless brands that drive leads and promote their respective organizations through Facebook – the largest social media platform in the world. These findings tell us that your employees are willing to promote your brand on Facebook, but you’re more likely to run into some resistance than you are for a LinkedIn activity. Retweeting was the No. 1 activity members carried out in 2018 across all Gaggles. Well, it was also the second most frequently requested activity by Gaggle Managers, and there really is no opposition from employees. Twitter is not as professionally-driven as LinkedIn, but it’s also not as personal as Facebook. Promoting an organization or a personal brand is extremely common on Twitter and in this action, employees share another handle’s post rather than posting a promotion themselves. People are happy to retweet, but they’ll do even more on Twitter. Three of the top seven activities employees carried out in 2018 were on Twitter, including liking tweets, which was No. 4. Again, liking is an easy activity to carry out, and it doesn’t require the user to post anything from their Twitter handle. In summary, we found many differences in the activities requested by Gaggle Managers vs. activities carried out by Gaggle Members. Your employee advocates are more than happy to promote your brand on LinkedIn. Employee advocacy program managers tend to request activities on Facebook more often than advocates promote them. Twitter is also very popular among employees, and retweets are the most frequently performed activity. What do you think of our findings? Do you notice anything different from your employee advocacy program? Feel free to tweet us what you see in your program! Ramin Edmond is a Content Marketer for GaggleAMP. He oversees the company's social media presence, editorial calendar, and all its digital content including blogs, case studies, and press releases. Outside of work, Ramin likes to run, hike, and take pictures of Boston's best views. You can get in touch with Ramin at REdmond@GaggleAMP.com, or connect with him on LinkedIn.